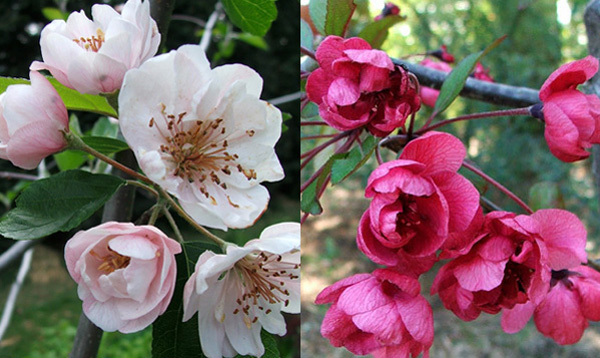 Malus Blossom - Jack Humm? The Crab-Apple (or Malus) trees in my garden are doing it again - blossoming beautifully in spring. And it wasn't so long ago that their fruits were brightening up the mid-winter months. What hard working little specimen trees they are! I like a well-behaved, modest tree - one that takes up its position with pride, doesn't grumble, and doesn't ruin the ground below or grow into a giant shade monster. I also like trees which give me more than one season of beauty, and the Malus trees I've planted throughout the garden certainly do that. My original Crab-Apple tree, which I can see from the house (a delight in winter when the blackbirds are busy) is very likely the variety Jack Humm. He's a strong little specimen, with shiny red fruit and the sweetest pinky-white spring blossom. 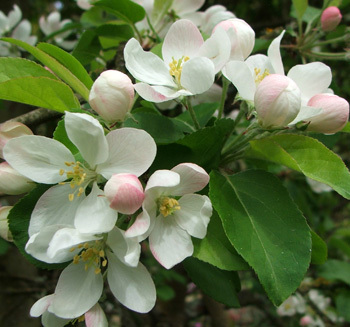 Then I grow a labelled variety called Charlotte, with yellow apples and the most beautiful late blossom. Charlotte spreads herself out somewhat - in fact, her branches, apples, and blossom are all on a larger and sparser scale than expected. I'm not sure if she's a New Zealand bred variety, or a common garden species. Deep cherry-pink blossom is a gorgeous foil in mid-spring for my yellow daffodils. There's a weeping cherry-pink Malus in Middle Garden which flowers when the green Gunnera leaves underneath are freshly unfurling. It's a beautiful pairing of colour and texture, and quite accidental - though I'd like to claim otherwise. And I did buy the tree and plant it there, so I could see it from the back lawn. If I remember correctly the name of this variety was'Ballerina'. Hope so! 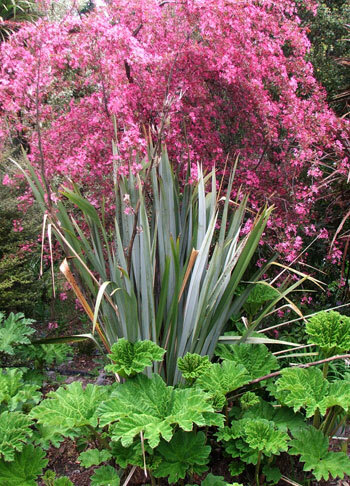 Down the Driveway I grow an upright Malus with similar flower colour, and a third little specimen, called 'Barbara Anne', is newly planted in the shrubby garden behind the pond. These flower blossoms are a really warm plum colour - so much less sugary than my Prunus pinks.